Now we’re gonna rock out at Game Accessibility Day. Sri Kurniawan, an engineering professor at the University of California Santa Cruz, worked with graduate students to make the drumming game Rock Band accessible to people with visual impairments. The modified version uses haptic and audio feedback, in addition to audio. To make Rock Band work for visually impaired gamers, the team figured out a way to strap vibrating pieces using velcro on a gamer’s upper and lower arms to represent the drumhead cues, and also on the ankle to represent the kick drum cue. Auditory information is used to provide feedback on correct and timely hit (with various drumming sounds) or errors (with a click sound). This is an incredibly cool modification. Reading the menus, song titles and scores requires only a computer’s standard speech synthesizer. Kurniawan and her team evaluated the game for people with various levels of visual impairment. They found that users were able to master the system almost immediately, with some users making no error halfway through the first song. The full results of their study can be found in their paper, Rock Vibe, Rock Band computer games for people with no or limited vision and can be downloaded here. 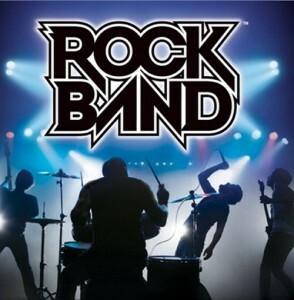 Rock Band is made by Harmonix Music Systems, and is published by MTV Games and Electronic Arts.